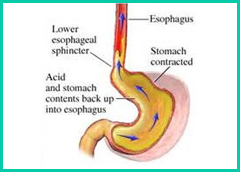 Food passes from the mouth to the stomach through esophagus (food pipe). This food cannot go back into the food pipe due to pressure of an intervening valve (the Lower Esophageal Sphincter, LES). Weakening or abnormal frequent relaxation (opening) of the LES causes Gastro Esophageal Reflux Disease or GERD. This condition may be associated with a Hiatus Hernia. A Hiatus Hernia allows a portion of the stomach to protrude into the chest. This condition can then cause failure of the LES mechanism. Although most cases of Gastroesophageal Reflux are caused by a weakened valve, there might be other causes that should be assessed by your doctor. Untreated Gastroesophageal Reflux can cause ulcers, bleeding, narrowing of the esophageal lumen (peptic stricture) that can cause difficulty in swallowing. In some patients, a condition called “barrett’s esophagus” occurs which may lead to cancer if left untreated. What is Gastroesophageal Reflux Disease Surgery? A physical examination and specific tests by your doctor can determine if you have GERD. Further, typical symptoms in upper GI Endoscopy show reflux and presence or absence of esophagitis. Barium swallow method is also used to detect the presence of reflux and associated Hiatus Hernia, if present. Once the condition of GERD is confirmed, medical or surgical treatment can be started. Medicines only relieve symptoms as long as a patient continues to take them. They do not cure the condition. For patients with persistent symptoms requiring long term medication, surgery is an option, which is also a curative mode of treatment. Surgery can reconstruct the valve (LES) as well as repair the Hiatus Hernia, if present. Conventional (open) surgery for GERD requires a large muscle cutting incision which results in a long lasting painful scar. 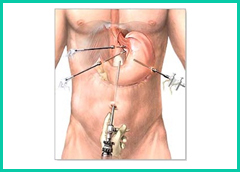 Laparoscopic surgery requires four to five tiny (5-10 mm) incisions to perform the same procedure. The advantages of Laparoscopic surgery are minimal post operative pain, short hospital stay and excellent cosmetic results. Over 90% of patients are symptom free after Laparoscopic surgical procedure for Gastroesophageal Reflux Disease. Dr. Pradeep Chowbey has achieved unprecedented milestones in the field of Laparoscopic surgical methods. In most probability he can be said to have popularize this surgical method both in India and in Asia-Pacific region. And since Laparoscopic surgery for Gastroesophageal Reflux Disease is most preferred method of treatment; therefore, none other than Dr. Chowbey should be considered for GERD surgery. His unparalleled skills in open surgical procedure for treatment of gastro eshophageal reflux disease again make him the best choice for people who are considering open surgery for GERD. Dr. Pradeep Chowbey has successfully performed thousands of open as well as Laparoscopic GERD surgery on patients in India as well as internationally. Any pre-op instructions that are to be given to patient by the surgeon vary as per patient to patient. After the operation patient will be kept in the recovery room. This period may vary from few minutes to few hours. The anesthetist decides about shifting the patient to the room. The decision depends on many technical factors. Patient may feel nauseated in the immediate post-operative period, and patient may even vomit which should not cause any worry. This generally gets over after few hours. Patient is generally allowed to have sips of water immediately after the operation and liquids on day of operation. In case of vomiting the liquid intake may be stopped and restarted after 30 minutes. The liquids may include water / cold drinks / tea / coffee / milk / juices or some clear soups. Patient is allowed to have normal home cooked meals of choice from the next morning at breakfast. And it is important that to prevent feeling bloated patient should have small frequent meals for some days. Patient should try to move the limbs and should sit up immediately after operation. Patient can go to the toilet on his own. Patient will be discharged on the same day or next day of operation unless there is some associated medical/social problems. Patient is advised to visit again for follow up after 2-5 days when the dressings are removed. Patient should avoid wetting the dressings unless they are waterproof. After the removal of dressing, patient can have normal bath with soap and water. In very few cases there may be some bloody/whitish discharge from the wound in the post operative period. This should not bother patient because it is generally harmless. Patient can wipe the discharge and apply band-aid so as to avoid staining the clothes. If it is more patient should report to the surgeon during the next visit. Patient should feel free to ask any question that may come to the mind. Cost of Gastroesophageal Reflux Disease Surgery depends on the condition of the individual and whether or not it is to be accompanied with Haitus Hernia surgery. The cost also varies as per the choice of the procedure.